Boeing in 2017 will press ahead with more cost reductions and job cuts amid a worsening short-term outlook for the industry. But readying for the next upcycle, the company is orchestrating a revolution in the way it builds jets. As 2016 closes, the global airline industry has entered a down cycle, confirming that the new boss at Boeing Commercial Airplanes, Kevin McAllister, will have a rough introduction to the job with no honeymoon period. Slumping airplane sales — especially of the large widebody jets — forced Boeing to announce Dec. 12 a big reduction in the pace of producing the 777 jet next year, confirming fears of job cuts ahead at the final-assembly line in Everett and in Frederickson, Pierce County, where wing parts are fabricated. A week later, McAllister made clear that despite the past year of relentless cost cuts and the shedding of jobs, there’ll be no letup in 2017. He told employees that Boeing will offer another round of voluntary buyouts in the new year andwarned there may also be layoffs. Yet even as McAllister manages this short-term gloom, he must also take a longer view and ensure Boeing is well positioned against Airbus for the next upcycle, expected around the end of the decade. To that end, Boeing is today orchestrating a behind-the-scenes revolution in the way it builds its forthcoming, more-efficient airplane models, the 737 MAX and the 777X. More automated and flexible production methods have already successfully transformed production at the Renton 737 assembly plant, and 2017 should see the MAX enter service ahead of schedule. Now, it’s Everett’s turn. Boeing is remaking 777 final assembly well in advance of the debut of the new 777X in 2020, hoping to fix any bugs early and avoid any disastrous 787-style delays. 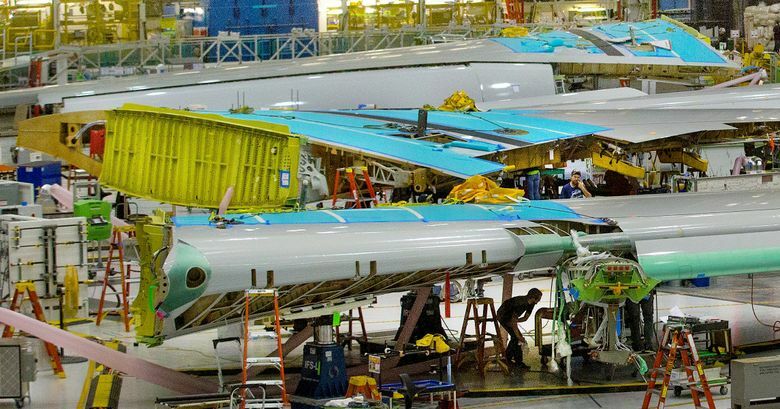 Meanwhile, it is finishing the adjacent plant to fabricate the 777X’s carbon-fiber wings, and fine-tuning a new robotic method of assembling 777 fuselages. Such a thorough transformation is clearly both ambitious and risky. With rival Airbus weighing the launch of a larger A350 model to compete directly with the 777X, Boeing needs to implement its new production system smoothly and on time. Taking stock of where the airline industry stands at the end of 2016, some experts are rattled by talk of tariffs and rising protectionism around the world, not least from President-elect Donald Trump. Randy Tinseth, Boeing’s vice president of marketing, agreed that open trade is critical for the jet maker, which will export 80 percent of the airplanes it builds in the next 20 years, a quarter of those to China. “It’s incredibly important to our business model, and to employment here in the Puget Sound region, that we be able to access international markets,” Tinseth said in an interview. Global air travel will remain on an upward trendline, said Dómhnal Slattery, chief executive of major airplane-leasing company Avolon, which is based in Dublin, Ireland, but was acquired last January by China’s HNA Group. “There’s no basis on which one politician or one country can put a block on globalization,” Slattery said in an interview. He cites a projection that the world’s middle class will grow by a billion people during the next 10 years, mostly in emerging economies such as China and India. Still, the near term is not rosy. Profitability in the cyclical airline industry peaked in 2016 and is trending down, he said. Airline profits have been hit by employee raises that labor unions negotiated to track the recent highs in annual earnings; by fuel prices on the rise again; and by lower fares as a result of a glut of airplanes. In addition, interest rates inching up, a stronger dollar and the possibility of inflation ahead all make for higher costs to purchase jets. Boeing’s market for new 777s, historically hugely profitable, is specifically undercut right now by the prospect that Emirates, the largest operator of 777s in the world, will let a slew of relatively young 777s come off lease in the next few years as it replaces them with 777Xs it has on order. “Where are all those used 777s going to go?” asked Slattery. Not only is he uninterested in buying any current model 777s, Slattery said he has no plans to buy the 777X anytime soon, either. He cited a lack of near-term demand for the 777X and its high price. “The business case for that jet has still to prove itself,” said Slattery. That’s a testament to how big a gamble Boeing makes when it develops new airplanes. Avolon will be the third-largest aircraft lessor in the world, with more than 900 jets in its fleet or on order, once it closes its acquisition of U.S. lessor CIT in March. Yet even as Boeing pours billions of dollars into 777X, this big player stands by and waits to be convinced there’s a market. Slattery is nonetheless close to Boeing, having a long friendship with former Commercial Airplanes CEO Ray Conner and knowing McAllister well from the new Boeing executive’s prior years at GE Aviation. Slattery agrees with Boeing’s assessment that a new industry upcycle should materialize late in the decade. In the new year, Boeing can look forward to the first flight of the latest Dreamliner model, the 787-10, at its South Carolina production site. In Washington state, it will certainly celebrate the first delivery of the 737 MAX from Renton and will also trumpet the production rate increase from 42 single-aisle jets per month to 47. It will have to decide if it wants to launch a stretched version of that jet, the MAX 10, to limit Airbus’ runaway sales advantage with the A321neo. The industry backdrop will remain tough. Jet sales will likely come in lower again than in recent years. The higher 737 production rate won’t compensate for the revenue lost from the widebody rate reductions in Everett. That’ll make quarterly profits less buoyant even as Boeing struggles to crawl out of the money pit of deferred costs on the 787 Dreamliner — a financial overhang Aboulafia says looks “increasingly untenable” and could lead to a large write-off. Boeing will continue next year to squeeze out costs. 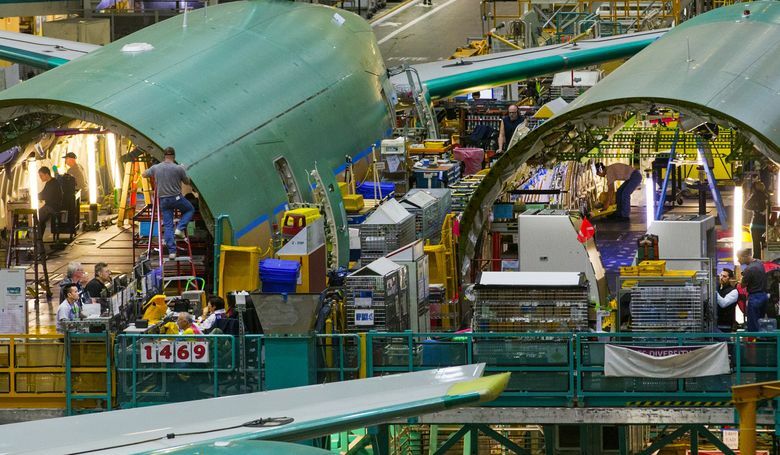 This year through November, Boeing eliminated just over 6,600 jobs in Washington state. It’s made clear that in 2017, the job losses will continue unabated. And yet, behind the scenes in Everett, Boeing is building for a better future it hopes is just a few years out. The success of McAllister’s tenure as leader will depend critically on the execution over the next four years of that intricate 777/777X manufacturing puzzle.